As if Peruvian food weren't already good enough. Then take said Peruvian food and wrap it in delicious dough. Add a side of lime for some zing and this girl is in culinary heaven. I'm noticing that more and more of my favorite things about Peru are related to food. No shame here, there's a reason why Lima has been named one of the Three Food Cities to Watch, everything is so so good. 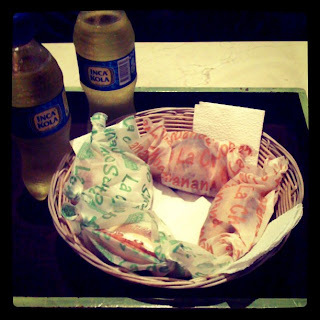 We recently discovered an empanada restaurant that makes gourmet empanadas filled with typical Peruvian dishes. They feature my favorites, lomo saltado and ají de pollo, as well as empanadas filled with turkey, steak and even Chinese food. Besides this recent find, one of my favorite bakeries sells their empanadas in regular size and mini, who doesn't love a mini empanada? It's the perfect quick bite, it's small, fantastic and travels well. Thank goodness spring is just around the corner, I have to walk off these empanada pounds.